This week our class will be celebrating Dr. Seuss' birthday and "Read Across America." Reading is such an important part of first grade. All of your life, you will read to learn, but in the primary grades, you learn to read. Seeing those "light bulb" moments in a child's eyes - that is my favorite part of teaching first grade! This Cat in the Hat inspired project has one design, three suggestions for classroom use, but many more possibilities. I created a simple hat by welding together two re-sized rectangles on the Gypsy. The first idea celebrates your child's favorite books. Each child can write the title and author of his favorite books on each stripe. This will be a great decoration for a bulletin board or classroom display. The second idea is an interactive learning center. Laminate these hats so students can use dry-erase markers on them. The children can browse Dr. Seuss books to find rhyming words to write on each hat. The stripes provide room for up to five rhyming words. Wipe the words off, and they are ready for the next poet! The third idea is a reading activity to reinforce rhyming words, spelling patterns, or word families. Use your favorite Seuss titles for inspiration. 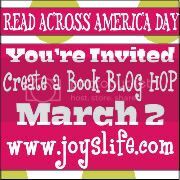 Join us back here, Tuesday, for a Blog Hop to celebrate "Read Across America." Wish I would have had you for my first grade teacher, but you probably weren't born yet! Ha! LOL! LOVE your ideas!